Dunedin, FL., November 15, 2014 — In this league, if you have a former major league pitcher, you know who your ace is going to be. For the San Antonio Reds, its 50-year-old and former Baltimore Orioles big leaguer Mike Smith. 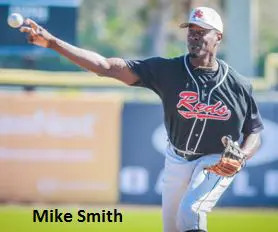 Smith, who spent seven years with three different MLB organizations, pitched a complete-game Saturday afternoon at Florida Auto Exchange Stadium to lead his Reds to an 8-3 win for the 45+ AmericanChampionship. It was Smith’s sixth overall championship since 1998. Smith was originally drafted by the San Diego Padres in 1983, didn’t sign, then was drafted by the Cincinnati Reds in 1984. In 1985,Baltimore took him in the Rule 5 draft, and after that, he rose through the Orioles system and reached ‘The Show’ in 1989-90, where he made 15 appearances, has a 2-0 record and 15 strikeouts. The Reds jumped out to a 3-0 in the first and added three more in the fifth. Leading the way was Rex Dela Nuez, David Oliver and Rafael Fuentes, while Smith had a hit, as well. The Salty Dogs were down 6-0 in the fifth, but did chip in two runs, including one off an RBI single from Timothy Braden, while Dave Palumbo had a triple in the ninth that led to Peter Parente driving him home. Its was a no brainer that Smith was named MVP following his pitching performance, and its games, and wins, like Saturday’s that make Smith’s decision to continue his impressive baseball career easy.